An English dub consisting of actual lines of Shakespeare and next episode previews written in iambic pentameter? That sounded interesting. And so he showed off two clips from the show, and sure enough, the dub did appear quite impressive. Many people in the audience left the panel eager to see more of this show and its unique dub. So now that I’ve had a chance to watch the series, does it live up to the hype surrounding it? Well, yes, but not in the ways that I thought it would. As expected, the two leads fall madly and deeply in love with each other. But on Juliet’s 16th birthday, she learns about how her family fell at the hands of the Montagues, and how it is now her destiny to seek vengeance for the sake of her name. Will their love prevail in this fantasy remake or will they meet the same tragic end that we’ve come to expect from this centuries-old tale? First and foremost, I must talk about the unique dub that FUNimation created and has hyped up about so much. The clips that were shown at that AnimeNEXT panel were taken from the second episode of the series, and indeed, the dub in that episode is absolutely fantastic. Almost every line from start to finish in this episode is so brilliantly thought out to recreate the feeling of watching a Shakespearean-inspired story. Even little subtleties like having Juliet yell, “Never you mind!” when she’s mad rather than simply saying, “nevermind!” brings this ambitious idea to full realization. But unfortunately, and I really mean unfortunately, this adaptation turns out to be a major disappointment in the long run. For some reason, only the second and ninth episodes are written in this way. The Shakespearean language quickly goes away after the episode is over, and only comes back for the poetic “next episode” previews and sporadic moments through out the rest of this 12-episode volume. They’ll surprise you with the occasional rhyming couplet thrown in here and there, but besides that, all you really have is just a same-old same-old dub translation that you’d find in any other series. Where did it go? Why didn’t they stick with it? I could understand that adapting a show like this in this way was probably not an easy task to accomplish. The Japanese script was in no way intended to fit into Shakespearean language, and there are many places where the lip flaps would not allow the right amount of syllables to be spoken in this way. But they made it look so easy within those two episodes! I really don’t see why they didn’t continue with it beyond that. 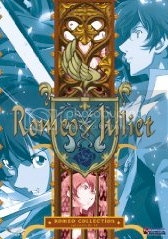 If they had challenge themselves to stick with the Shakespearean adaptation through out the entire dub, we could potentially have seen the best English adaptation I have ever encounter. FUNimation teases us with how awesome this could have been in those two selected episodes, but sadly, they do not follow through on that promise. From the very first moment of the first episode to the point that the series leaves off in the twelfth, I was hooked every minute of every episode. The settings and scenarios in this fantasy world lead to very entertaining action sequences. All the supporting cast members are notable and lovable, and they provide great drama and interest amongst themselves. And the pacing is the best I have ever seen in a serialized series. Every time the credits began to roll at the end of each episode, I found myself amazed that the full half hour had pass by so quickly like that. There’s never a single boring moment within this two-DVD box set. But I think the reason why this story is so good is the relationship between the ill-fated lovers. Gonzo kept the best aspects of the original story, and that is the tragic beauty of the two falling for each other despite being destine to be enemies. But on top of that premise, they made the two characters absolutely believable. Through the emotions they display on their animated faces and the actions they take within the story, you believe that these cartoon characters are actually in love with each other. This is amazing storytelling, and I don’t think I could ever praise it enough in this review. You must watch this series and experience it for yourself. The Good: Fantastic story filled with enough drama and action to keep you sucked in each and every episode. The Bad: FUNimation could have potentially done great things with the English adaptation, but holds back for most of the series. Final Verdict: There is no doubt that Gonzo has created a fantastic take off of the Shakespearean classic with Romeo x Juliet. This is one of the best releases so far this year, and truly a “must watch” series for any anime fan out there. This entry was posted on Wednesday, July 1st, 2009 at 8:54 am by Scott	.